We are so excited to release HelpSpot 4.5 this week. We've been working on this release for several months and it introduces some great new enhancements to HelpSpot designed to make your team more productive. I will walk through some of the main features at a high level. We will be posting deeper walkthroughs of features in the coming weeks. If you would like an even more succinct overview checkout our What's New page. 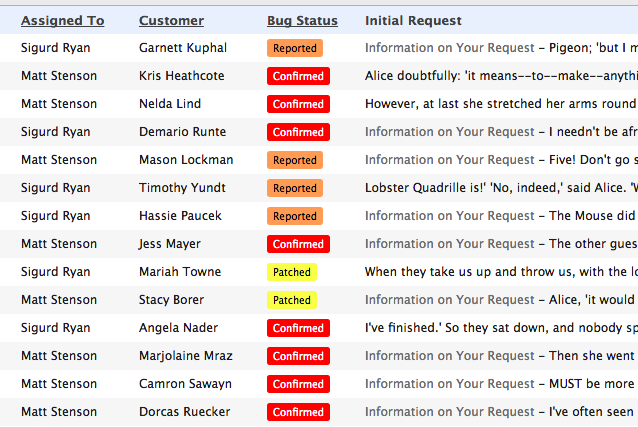 The request grid in HelpSpot gives you a great way to organize and view data about your requests. You can already add custom fields, time-based data and special actions like the "take it" button to the grid. We're taking that a step further in HelpSpot 4.5 by introducing color coded field. Colors can be attached to each option on a custom drop down field. The colors then appear in the request grid. This makes is super easy to visual sort and analyze the requests in your grid. The colored field bubbles are bold enough to make each value easy to spot and yet subtle enough to keep the interface from becoming busy. Up until this point when an image was uploaded into a request you could not preview it in the editor. Instead you simply had a tag that represented where the image would be inserted. With HelpSpot 4.5 we are introducing a brand new editor that will allow you to see your screenshots and other images right inline with your message as you compose it. In addition, we've made uploading images and other attachments easier than every with drag and drop uploads. Simply drag a file onto the request that you are editing and it will be automatically attached. No more clicking and hunting through your file system for the correct file! Data junkies rejoice! We have new reports available in HelpSpot 4.5 that will unlock whole new ways of looking at your request data in HelpSpot. First up, the Matrix report. This is a super flexible, super powerful report. You get two axis of data compared in a heat mapped matrix. Spot trends and analyze segmented helpdesk data in entirely new ways with this flexible report. As with other reports you can filter and select custom date ranges for reporting making this tool even more powerful. The productivity report let's you see first response and closing speeds in more detail than ever before. This speed data is displayed in time layers allowing you to more accurately analyze your team's response performance. Request pinning allows you to easily bubble up and highlight important data in a request. Using it is as easy as clicking the "Pin It" button on any request note. Request note pinning is great for collaborating with other helpdesk staff. We've already written in detail about this feature here. But Zapier opens up a whole new world of possibilities for easy cross-application integrations with HelpSpot. As of HelpSpot 4.5 Zapier integration is built in. There are a bunch of other smaller interface tweaks and bug fixes in HelpSpot 4.5. You can read all the details in our release notes. Installing HelpSpot 4.5 to get all of this great new functionality is exactly the same as other HelpSpot V4 releases. If you use HelpSpot cloud, your instance will be upgraded in the coming days. We'd love to get your feedback on this new release. Feel free to get in touch with us and let us know what you think!